Our involvement with the Academy of the Immaculate Books is a result of our spirituality of St. Maximilian Kolbe to make Our Lady known and loved by all means, including the media. Helping the Franciscan Friars of the Immaculate to sell the Academy books provides an opportunity to focus on this aspect and to discuss various Marian teachings with customers. When customers place their orders on line at MaryMediatrix.com, we pack and ship the orders in a timely manner always eager to fulfill St. Maximilian’s hope: “We must place our Lady in every soul so that from every soul sin be expelled and Jesus introduced. Who finds the Immaculate, finds Jesus.” Also, as part of the media apostolate, we tape programs that will be aired on the Franciscans of the Immaculate radio station (Radio CorMariae), proofread articles in the Marian magazine: “Missio Immaculatae” and occasionally author Marian related articles. We utilize the variety of media and place these means in the service Our Heavenly Mother. 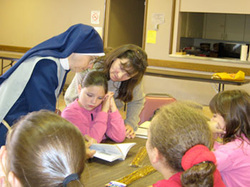 What can be more vital and more inspiring than teaching CCD to the children? We teach the students how to love Jesus and Mary by expounding the truths of our faith, proclaiming the gospel of Jesus Christ, encouraging participation in the sacramental life, praying with the students and assisting them to grow in Christian Charity. Always faithful to the magisterial teachings of Holy Mother Church, we instruct the children how to apply their CCD studies to daily life. As we engage the students in discussions about their current life situations, they learn how essential the faith is to them in resolving their day to day problems and concerns. Another exciting venue of educating the children is Vacation Bible School, which brings the bible to life for the young. This program inculcates Catholic teaching in this weeklong session, incorporating fun and games with biblical lessons. The Drama class is especially fascinating to the children as topics from the bible are acted out with unique props and special effects. The children especially enjoy the songs and dance steps that are used to reinforce the daily themes. It is a wonderful way to joyously spread the gospel message and help the children to love Jesus and Mary. It is a blessing to have the opportunity to restore the artwork and statues in churches. A lot of the work has to be done in church, in the presence of Our Lord in the Blessed Sacrament. What a joy it is to know that something has been done to warm hearts and prepare them to encounter our Lord. 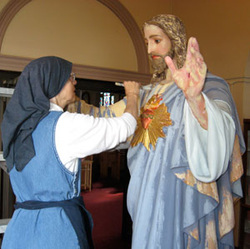 Smaller statues, such as pieces from nativity sets that have become chipped or damaged, are brought to the studio room in the convent to be repaired. Parishioners also bring statues and articles that need repairing. What a variety of pieces! New statues and original paintings are also made in the studio. They are sold either at church Arts & Crafts Fairs or, as has happened, paintings were auctioned to help finance an orphanage in Nigeria. The Franciscan Handmaids of the Immaculate are involved in the life of the Parish. We are able to help in any way needed. If there is a parish school, we could teach or work there and help with tutoring and homeschooling. We visit the sick in the hospital or in their homes. We are especially involved in the promotion of Eucharistic Adoration. We host the Vatican Exhibit of approved Eucharistic Miracles as well as organize and coordinate the annual parish Corpus Christi procession. By promoting Eucharistic Adoration and First Friday devotions, we hope to bring souls to a closer relationship with Our Lord. The FHI have a missionary spirit – we want to spread the faith and bring people to know and love Our Lady. To accomplish this, we make a variety of religious articles: rosaries, rosary bracelets, chaplets, etc. and a variety of sewn goods. They are sold at Arts & Crafts Fairs and Festivals and the proceeds are then given to the F.I. Missions in Africa and India. People are very happy to see us, and to speak with us. They ask questions about the missions, the faith, have prayer requests, or just want to talk. Attending events in an informal setting, such as a festival, gives the opportunity to meet people of other faiths and to meet Catholics who are not living their faith. By having a friendly disposition and greeting people cheerfully at a festival – what a wonderful way to evangelize and bring souls to Christ! 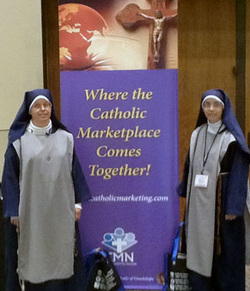 We were very happy to be able to attend the CMN Tradeshow convention held this year in Dallas, TX. We were there to help the F.I. Friars with their apostolate, the Academy of the Immaculate, in selling the books they publish. It was especially heartwarming in this Year of Faith to meet many people from all over the U.S. who were so enthusiastic about their faith. Their commitment and desire to find good Catholic literature for their own enrichment and in order to help spread the faith was most edifying. There was also time to visit the neighboring city of Arlington where we discovered a Shrine to Our Lady of La Vong and the Vietnamese martyrs. It is a beautiful Shrine, typically Asian, even to the plants and gardens around the Church – right there in the heart of Texas. Definitely worth seeing!